Even if we don’t know with any degree of certainty that there is an after-life… even if this ‘religion stuff’ seems pretty much man-made … even though the world seems to pay more lip-service to Christianity than to living it — the one thing that the Easter Christian is gifted with is HOPE. There is so much historical data and martyred lives and witness to help support our hope. And now — we’ve completed the forty days journey through a Lenten desert. 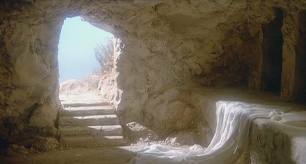 The large stone has been rolled back and we are alive with Christ. 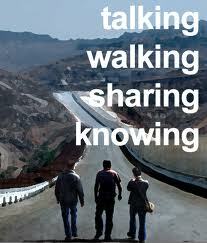 We are called to start a pilgrimage as to Emmaus. We are called once again to begin a pilgrimage to go and share the good news. That’s what the story of the two disciples on the road to Emmaus is about – men on a journey and who were gifted with a meeting with the Dispenser of Hope. If you read much of my writing or have heard my homilies or our Catholic Vitamins podcasts, I’ve often talked about Catherine Doherty of Madonna House. For dozens of years she used to come to visit Winslow, Arizona, some 90 miles north of where I now live. She is being considered by the Church for sainthood. She wrote many books and articles. Some tell of Russians who set out on holy pilgrimages. These pilgrims leave home with no little or no money. They leave home with only one day’s food and drink. A destination can be hundreds of miles away. The pilgrims bring Christ with them. And often, these pilgrims experience Christ in the homes they are invited to stay in. So for you and me, when we set our on our own journey to Emmaus, we need not worry how well educated we are or how equipped to lead others we are. All we need to do is to pray, and to ask Christ to send His Spirit to guide us…. and to stay within the practices of the 2,000 year old Catholic Church. When we face the meaning of Easter we are at the crossroads of life and belief. With HOPE, we eventually must choose one way or the other. Am I a casual tourist with rose colored sunglasses sort of meandering through this Christ-is-alive stuff? Or am I am real pilgrim for Christ? What do I believe? No matter what my parents or my friends believe. It is a question I can only answer for myself. Have I come to this point in my life… this repeat of the celebration of Easter because I really believe in the resurrected and glorified person of Jesus? Is he real to me? Do I have a relationship with him? Does Easter express reality? Do I believe that death is not a period – that it is a comma in our existence? I have HOPE — with capital letters. I don’t know what it will be like. I once heard an 80-something year old priest who was giving one of his last sermons and it was about heaven. He said that when we are in heaven, we will all have seats on the fifty yard line — with no obstructed views. We’ll all be in immediate proximity to the Lord Jesus. And we’ll be able to talk with him as much as we want. And Mary will be there, and Peter and the two disciples from the road to Emmaus. And all our faithful family members. I don’t know about you — but in the words of the popular Christian song of recent years… I can only imagine.